According to a 63-year-old woman who drove her Ford Taurus into a Connecticut liquor store Friday afternoon a combination of Armor-all and Nyquil are to blame for the incident. Sharon Brooks of Easthaven, CT was charged with Reckless Driving and Driving Under the Influence after she drove her car " halfway into the store, striking the counter, crushing displays of wine and injuring an employee inside" on Friday Afternoon. According to MSNBC.com, the employees injuries were relatively minor. Brooks said the whole incident was to blame on a clean car and a stuffy nose. The woman told NBC Connecticut she had a cold. She admitted to having taken Nyquil and explained "somebody cleaned the inside of my car and they put Armor All on my brake pad and my foot slipped off the brake pad." 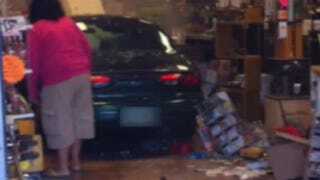 The woman didn't comment on what her plans were if she had made it to the liquor store without driving through it but the owner of the damaged store identified Brooks as a regular customer.